“I would like to see everything, to look at everything.” (1) These are Josef Koudelka’s words quoted by Robert Delpire, his friend, editor and curator. “My photographs, you know them. You have published them, you have exhibited them, then you can tell whether they mean something or not.” (2) The fact is Robert Delpire is far from being a novice in the world of photography. Unbeknownst to many, he was the first publisher of Robert Frank’s The Americans in 1958, a year before Grove Press in the U.S., and the first director of the Centre National de la Photographie in Paris. An event eclipsed all others last summer at the 33rd Annual International Photography festival in Arles, France: the Josef Koudelka retrospective curated by Robert Delpire. (4) Les Rencontres d’Arles, as this festival is now officially called, needed a gros coup, a change of direction. Sponsorship and attendance had been dropping for the past seven years despite various attempts to revive one of the oldest photography festivals. A new president, Francois Barre (director of Beaubourg museum in Paris from 1993 to 1996) and a new board (including Jean Baudrillard, Robert Delpire, Alain Fleischer, Jean-Luc Monterosso (5) had been chosen at the end of 2001 Rencontres. They appointed a “new” director for the next five years, Francois Hebel. He had been a previous director of the Rencontres in 1986 and 1987, the director of the Paris bureau of Magnum from 1988 to 2000, the assistant-director of Corbis Europe in 2000 and 2001. He left Corbis in the middle of turmoil, surrounded by frustrated photographers, to join the team of the Rencontres. With new old blood, new energies, the festival in the summer of 2002 heavily relied on Magnum (6) for its appeal and presented 30 exhibitions in 18 locations, most of them situated within walking distance in the antique Mediterranean city. It also offered two international conferences, 19 workshops, and eight night projections at the antique Roman theater. 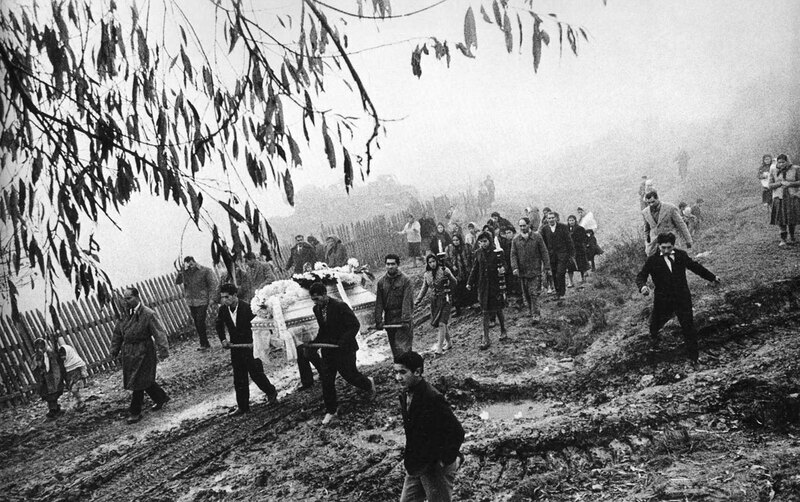 At the chore of the 2002 programming was a comprehensive survey of Josef Koudelka’s lifework. In order to cover the scope of his phenomenal oeuvre and draw audiences back to Arles, Hebel with the help of Delpire opened four different spaces to the retrospective, a first in Arles. Hundreds of Koudelka’s black and white images of various formats and sizes created during a career that spans over 40 years were on display for thousands of eyes. The retrospective was organized followed the course of the photographer’s life. An evening projection was also dedicated to Koudelka’s work but failed to meet the audience’s expectations. What could have been an opportunity for the artist to explain his vision and projects and expand on them, one of the delights of such evenings in Arles as illustrated later that week by Larry Sultan, was only a reiteration of the exhibitions. Koudelka, in accordance with his own words (see above), remained almost silent during the duration of the event compelling the audience to go and buy the latest-published book on him that was being sold in the local bookstores (7). In 1962, the photographer embarked on an eight-years’ project, a photo-essay in the tradition of Life magazine as revisited by Eugene Smith and Cartier-Bresson, on the Gypsies of Czechoslovakla. Born in 1938 in Czechoslovakia and trained as an engineer, Josef Koudelka turned to photography very early on. His first professional work began with photographs taken for theater companies and magazines in Prague. The first exhibition space of the Rencontres was mainly dedicated to these images. 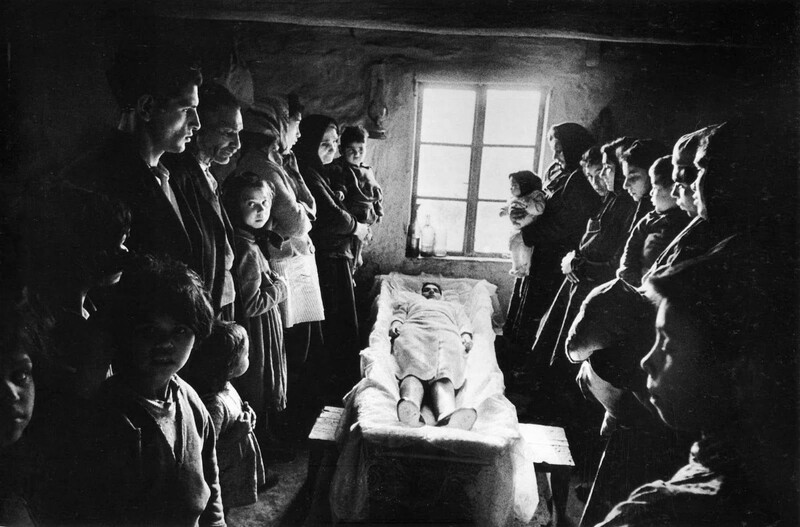 In 1962, the photographer embarked on an eight-years’ project, a photo-essay in the tradition of Life magazine as revisited by Eugene Smith and Cartier-Bresson, on the Gypsies of Czechoslovakla. The work was noticed by Anna Farova, a famous Czech critic and curator. She showed Koudelka’s photographs to Allan Porter, the editor of Camera (Switzerland), and to John Szarkowski, the director of photography at MoMA. Porter published the work as a portfolio in Camera in 1967 and then as a monograph in 1979. 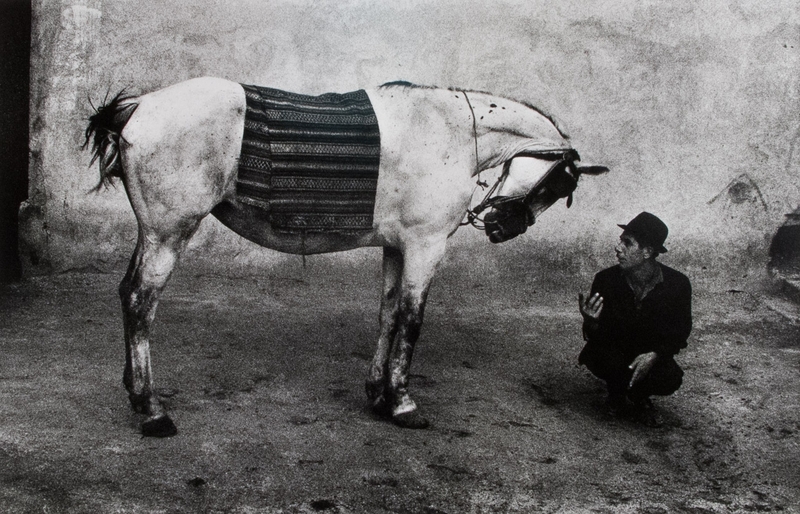 Szarkowski included Koudelka in his famous Looking at Photographs show and catalog of 1973 and in 1975 gave Koudelka a one-man show at MoMA while Aperture published the accompanying book Gypsies (8). This vast body of work was solemnly showcased at the 2002 Rencontres in a large exhibition room at the Espace Van Gogh, the only light sources being the halogen lamps lighting the photographs, giving the impression that the exhibition was held in a church. In tune with the somewhat solemn atmosphere, the visitors seemed to be aware of the close proximity of the Saintes Maries de La Men, a well-known Gypsy shrine, and to pay respect to the ancient Gypsy culture which has played an important role in the local life, the Camargue life-style, with its music, its strong religious feeling and its love of horses. The third body of work on display at the Rencontres was composed of the images that launched Koudelka’s career as an international photographer and opened the doors of the prestigious Magnum agency to him (9). Dramatic events had taken place in Czechoslovakla in the spring of 1968 and Koudelka had witnessed them firsthand, and recorded them on 35 mm film. His images of the invasion of Prague by the troops of the Warsaw Pact were smuggled out of Czechoslovakla to the U.S. and distributed via Magnum to newspapers and magazines around the world. For safety reasons, Koudelka, still in Czechoslovakla, was awarded the Robert Capa Prize for these photographs anonymously. At the time, Delpire, at the Centre National de La Photographie, understood how important the work was and knew that magazines had only published a small portion of it, often favoring the most sensational pictures. Many saw the black and white photograph of the student opening his shirt and offering his bare chest to the gun of a Russlan soldier standing on top of a tank, but not so many saw the image of that young woman crying, holding a blood-stained flag. The Centre National de La Photographie published the entire series in 1990 in a speclal collection within the Photo Poche series under the title Prague 1968. In 1970, Koudelka managed to leave his country and sought refuge in England, from there he emigrated to France where he became a Magnum associate in 1971 and full member in 1974. Since that time, the photographer has lived in exile, both physically and mentally, and his photography has established its roots in this state of being, as illustrated by the exhibition, Josef Koudelka (10) curated by Delpire at the Centre National de la Photographie in Paris. The book, Exils, was published as a catalogue to the show by Delpire in 1988 (11) and by Thames and Hudson in London as well as Aperture in New York the same year. Although Gypsies dealt with the daily lives of these traditionally migrant populations of Europe, Exils (Exiles in its English version) was not designed around a specific theme except its alienated and alienating atmosphere, which is why Exils is a complete departure from the Gypsies, Gypsies was composed of portraits where the sitters were facing the camera, completely aware of the photographer’s p resence and accepting of it, thus allowing the photographer to enter a world that very few gadje (non-Gypsies) know from the inside. There are also more spontaneous, “non-portraits” where the instant becomes decisive and conveys the strength and depth of Koudelka’s vision. 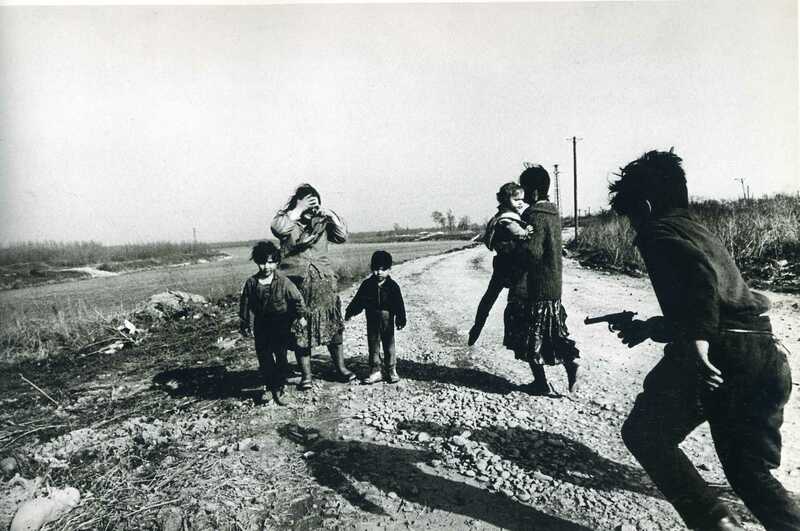 These images are extremely dynamic and enigmatic, as is the case with “Okres Nove Zamky” (1967) where a teenager holding something resembling a toy gun, big enough to be real, is running in the foreground toward a group of two women and three children standing on a dirt road in the middle ground. The ambiguity of the scene arises from the fact that one of the two women is carrying a young child, the youngest of the three, and turning away from the running boy, as if in a gesture of protection. Another disturbing factor is that the main protagonist of the photograph, the disheveled running youth, seems to be casting two long human shadows onto the ground, drawing a threatening diagonal rising in the direction of the peaceful group. We are wi tnessing here, through Koudelka’s frame, the violent confrontation of a young male with motherhood and childhood. The ambiguity sometimes present in Gypsies reached a climax in the following body of work. Dramatic events had taken place in Czechoslovakla in the spring of 1968 and Koudelka had witnessed them firsthand, and recorded them on 35 mm film. His images of the invasion of Prague by the troops of the Warsaw Pact were smuggled out of Czechoslovakla to the U.S. and distributed via Magnum to newspapers and magazines around the world. 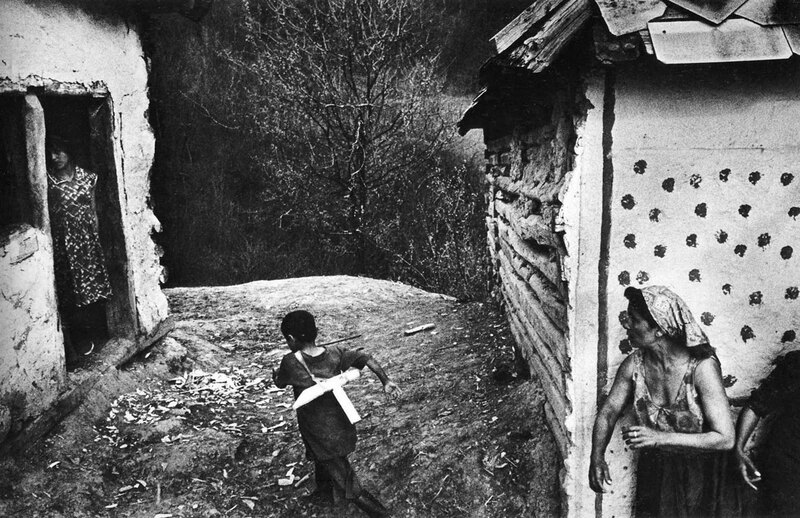 There is a constant tension in Koudelka’s photographs. 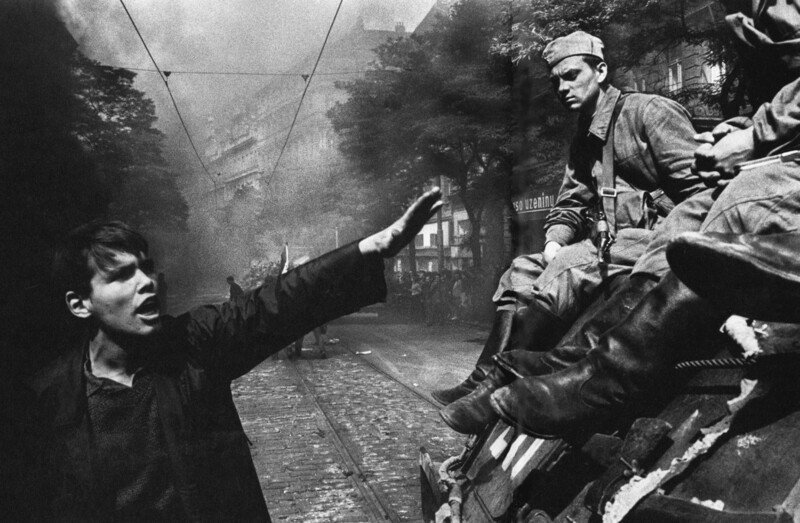 It pervades every image he has taken since the Prague invasion of 1968. Exils begins with the only view of Prague in the book, one taken of a large avenue at midday, completely deserted, similar to a scene from H. G. Wells’s War of the Worlds though eerier as there is hardly a trace of violence. The silence that reigns echoes the one that follows the fall of the curtain at the end of the fifth act of a tragedy. But there is no applause here, just cold silence; only someone’s arm stretched across the foreground, showing the time on his watch, diffuses the idea of death. Death, however, is a constant player that waits in the wings of several of the photographs of Exiles. It is definitely introduced in the first chapter with the image of a man sleeping on a stone bench in his coat. His slumber evokes Hamlet’s “sleep of death,” one that is haunted by nightmares only. A few pages later, another image shows a turtle on its back, frozen on a dark and dull day, o ne of those days when “the sky weighs like a solid and heavy lid over the earth.” (13) The first chapter ends with a pile of debris, a leitmotive that will become extremely familiar in Koudelka’s latest coffee-table book of large black and white panoramic views, Chaos. Dark and long shadows, and again people seen from their backs, giving no human eye contact, populate the pages of chapter two. It is as if Koudelka was constantly taking us along the streets of Prague in that winter of 1968. Black is the color of Koudelka’s vision in Exils. A pile of fallen timbers echoes the previous debris and reminds us of the punctuation of Old Glory in Frank’s The Americans. Koudelka pushes further Frank’s vision that was dismissed when his book first came out because of its apparent dullness and claustrophobic atmosphere. The Czech adds here the rigorous use of the frame advocated by Henri Cartier-Bresson (no wonder he felt at home at Magnum, no wonder Cartier-Bresson and Delpire welcomed him, although, paradoxically, Elliot Erwitt, the agency’s jester was the one who introduced them). Rigor is what concludes this second chapter, with an image that is so strictly composed and so ideally geometrical, that even the centenary buildings in the background look staged; time seems to have stopped its flight and a lonely woman, seen from her right profile, looming over a block of stone in the foreground looks “statuefied” and “medusa-like.” Religion, death and solitude, again, are the themes of the third chapter. The fourth chapter concentrates on an eerie situation where and when everything, even the people who inhabit them, seem elsewhere, unreal, lost in utter and incomprehensible de tachment; waiting for Godot without exchanging a single glance or a single word. Chapters five and six reiterate and reinforce the same atmosphere although the last images seem to introduce a certain lightness of being…in quiet desperation. Exils is a definite turning point in Koudelka’s work and the subjects and the format chosen for the ensuing projects only confirm this. In Aries, though, this particularly meaningful body of work was not given the space and importance that its power and relevance deserve, mainly by lack of appropriate space and the same chapel also displayed the beginnings of a new era in the photographer’s life: the move from 35 mm to panoramic medium format. 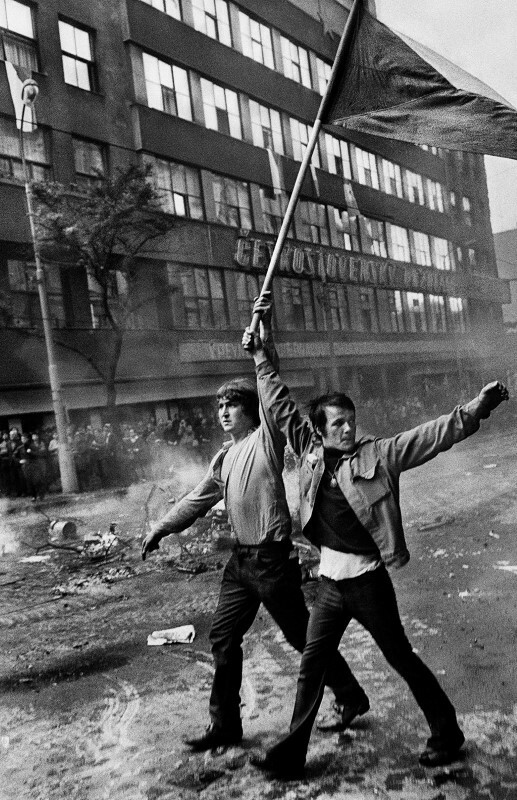 In the world of Josef Koudelka, all things human express the futility and the devastation engendered by a neverending quest for power, through technological and violent means, best exemplified by war. In 1986, for a project commissioned by the French government and whose goal was to document the French landscape at the end of the century (14), Koudelka had started to use a medium format panoramic camera. Along with a new approach and format (“new” not only for Koudelka at the time but panoramic views seem to have regained fashion in landscape photography lately) the 2 1/4″X 6 3/4″ (6 cm X 17 cm) negatives allowed for mural-sized enlargements, a possibility that the photographer has fully used in the shows that have followed. From Paysages Photographies, La mission de la Datar to the Cross Channel Mission (15), Regards d’acier (commissioned by Sollac, a French steel manufacturer), The Black Triangle (1990-1994) in the Ore-Mountains of Bohemia, Ulysses’ Gaze, Beyrouth Centre Ville (16), Reconnaissance Wales, Limestone and more recently En Chantier, Koudelka has been visiting the devastated and dilapidated landscapes of the post-industrial and postmodern era. His travels have taken him to Berlin, Beyrouth, Pa ris, Czechoslovakia, Bosnia, France, Germany, Greece, Poland, Romania, Ukraine, and Wales. In 1999, the fruit of thirteen years of errance in the pursuit of the ruins of modern civilization, of the consequences of abandonment and entropy was edited and brought into an impressive coffee-table book/essay, Chaos by the same Robert Delpire. Taken out of their specific contexts, the apocalyptic images made during the above-mentioned assignments, as well as various personal trips, acquire a wider general meaning and validity. Chaos stands as a monument to the aftermath of the industrial revolution and the modern era, it is the toll of the modern age. It stands as the result of Koudeika’s very powerful and idiosyncratic vision, one already formulated and distilled in the stark and sometimes mysterious photographs of Exils. On various occasions in Chaos the artist seems to take formal and esthetical “risks,” leaving aside the “ordering of chaos” that is typical of the approach to traditional composition and most of h is previous work, even moving away from a sequel of a trend that tends to focus on the “in-between moments”, and the periphery of the decisive moment and the frame, as exemplified in Raymond Depardon’s work (17), one of Koudelka’s colleague at Magnum. In the following images in Chaos, “Beirut, Lebanon, 1991” (p.13 and again 42), the central image of the triptych made of three vertical panoramic views (p.15) taken in San Francisco [990, “Germany, 1995” (p.82) and “Slovakia, 1991” (p. 86-87), the content of the photographs and the world seem to implode. The viewer loses its footing, the world sinks. Top / bottom, left / right do not make sense anymore as if photographer, camera, audience and mankind with them were being swallowed by a huge and monstrous maeistrom. The world loses its shape, the horizon sinks to become a giant entropic magma. The world as we know it seems close to its end and becomes a dark landscape of the mind which is not without evoking some images by Carl Chiarenza (18) in a more viscous an dynamic form though. He is a photographer who has hardly ever worked on other people’s assignments. When he has photographed on commissions, Koudelka has always managed to keep carte blanche and to choose his own subjects. Chaos, the show as well as the book, takes a new turn in the presentation of Koudelka’s work. Vertical images are more frequent, which is a rare occurrence with panoramic format. They are often grouped in triptychs. They have no specific common titles, each image retains its caption specifying location and year. “Beirut, Lebanon, 1991″/”San Francisco, U.S.A., 1990” / “Poland, 1994” (Chaos, 15) becomes a very abstract composition reminiscent of photographs by Minor White, Walter Chappel or Carl Chiarenza. “Palermo, Italy, 1993” I “Ukraine, 1992” I “Berlin, Germany, 1990” (Chaos, 20) does the same, playing on the commonality of shapes and textures. A circular shape always either emerges from or sinks into a ravaged surface. Desolation has become global and the photographer’s world is decidedly anchored in formalism. Through Robert Delpire’s vision of Koudelka’s work and his editing, the work reaches far beyond the humanistic genre of photography that Magnum is famous for. It takes a connotation that must be fam iliar to the readers of William Blake’s poetry or the viewers of Akira Kurosawa’s movies, an apocalyptic vision of a world devastated as a result of human folly. “Valencia, Spain, 1989” / “The Wall, Berlin, Germany, 1990”! “Beirut, Lebanon, 1991” (Chaos, 30) combines two views of war zones, strewn with the remnants of political violence and combat, with a photograph of an abandoned statue protected by a shroud of plastic, as if in a body bag, a timber and some pieces of wood propped against it. This dismal, lugubrious atmosphere is somewhat echoed in its evocation of death, a pervading theme in Koudelka’s work, by “Crimea, Ukraine, 1993” (Chaos, 75) showing a closed metallic coffin abandoned among ruins. This theme has always been subtly present in Koudelka’s work after the Spring of 1968 in Prague. It was already there in Exils in that photograph of a dead crow hanging from a horizontal barbed wire, the very image that Delpire had chosen for the cover of Josef Koudelka, the little monograph published by the Centre National de la Photographie in 1984 (20). (5.) Jean-luc Monterosso is the director of La Maison Europeenne de la Photographie in Paris and one of the creators of Le Molt do is Photo, Paris biannual photo-festival. (7.) 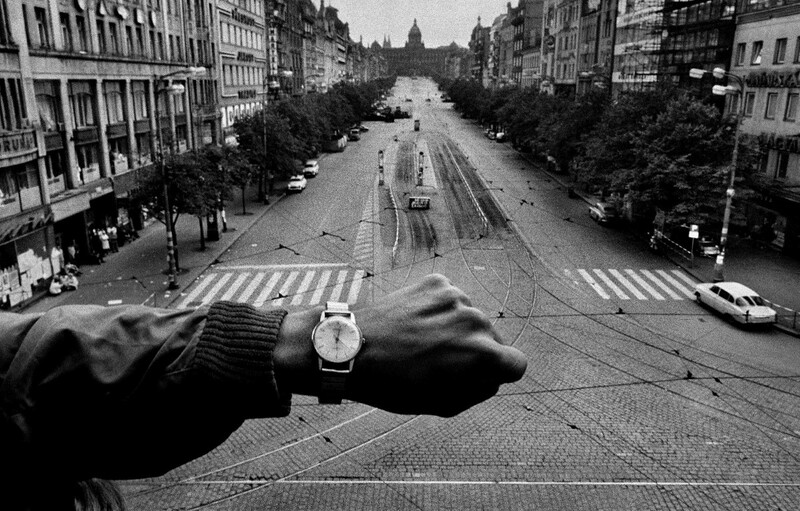 Josef Koudelka, (Prague Torst, 2002). With probably the best price/content ratio, this paperback contains quality reproductions of Koudelka’s retrospective and a rare interview of Koudelka. (9.) In order to become a member of Magnum photographers have to be co-opted by older ones and voted in. The agency is famous for its code of ethics and its in-depth studies of subjects as well as the formal and esthetic qualities of its members’ images. (10.) Josef Koudelka, retrospective show curated by Robert Delpire at the Centre National do la Photographie, Paris, 1988. (11.) Exils published by the centre National do Ia Photography in 1988 was also released the same year as Exiles in London by Thames and Hudson and in New York by Aperture along with a show alto curated by Delpire at the Iternational center of Photography in New York The Maine Photographic workshops granted it the Book of the Year Award. (12.) In the Introduction of his book of photographs, camera in London (1938), the English photographer Bill Brandt defines what motivates and triggers his photographic impulse ache strolls along the streets of his dry, an echo to Baudelaire’s or Walter Benjamin’s Flaneur. Both Brandt’s and Koudelka’s works have a very strong sense of “atmosphere”. a very compelling character conveyed by dark tones, strong lines, almost disturbing at times. (13.) Baudelaire, charles, “Spleen.” Los fleurs do mal (1861). (14.) The DATAR project / Paysages photographies. la mission photographique de la DATAR (1986-1990), a project funded by the French government after the 1861 Mission Heliographique, commissioned about 20 photographers, among whom were L gait, F. Golkhe, G. Basllico, R. Dopardon, R. Doisneso, J. Koudelka, T. struth. This initiative was followed by several other “missions” in several French regions such as the TransManche/Cross Channel project, la mission du littoral, and Lea 4 saisons de Metz pour la photographie. (15.) La Mission TranaManche/The crosschannel Mission, Cahier 6 in 1989, was Koudelka’s first monograph using panoramic Images and that was presented as an “accordion” book. This format allowing 8″x23″ reproductions on two pages was used for the books that followed (The Black Triangle, Reconnsistance Wales, Limestone, En chantier. (17.) Raymond Depardon is another member of Magnum, which he joined in 1979 after leaving Gamma that he had co-founded in 1966. Volume 81 of the Photopoche series is dedicated to his work. Ho has published numerous books and Is also a famous documentary and fiction film director. He waa chosen for the 1997 Annual of Reporters sans Frontieres (Reporters without Borders) and participated in the DATAR project. (19.) Josef Koudelka (Prague: Torst, 2002), 139. (20.) Josef Koudelka, * Photopoche * series (Paris: Centre National do la Photographie, 1984). (21.) John Szarkowski, Gypsies (New York: MoMA, 1975). 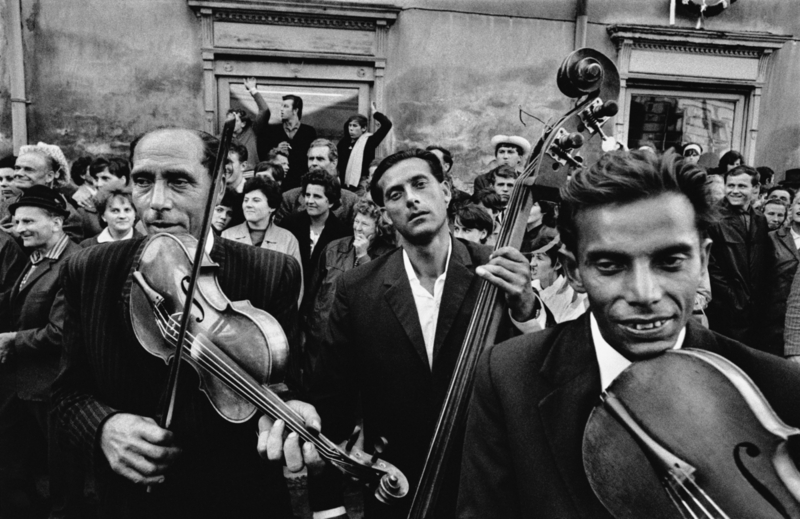 Photographs by Josef Koudelka. Text Will Guy. Posted in Documentary, Essays, Highlights, Magnum Photographers and tagged Documentary Photography, Exhibition Review, Josef Koudelka, Magnum Photos, Prague, War Photography.